Overview - Escape into the enchanted world of chivalry and romance in Stardust, an epic tale starring Claire Danes with Michelle Pfeiffer and Robert De Niro. In hopes of wooing a beautiful girl (Sienna Miller), Tristan (Charlie Cox) promises to bring her a falling star. But he’s in for the adventure of his life when he discovers the star is actually a celestial beauty named Yvaine (Danes) When an old witch Lamia (Pfeiffer) attempts to steal Yvaine’s youth, Tristan must protect her at all costs, in this magical family adventure that will make you fall in love over and over again. There's been an attempt in certain quarters to promote 'Stardust', the moderately-budgeted fantasy picture based on a novel by Neil Gaiman, as a new generation's 'Princess Bride'. Don't buy into it. I can't speak for the novel, but the movie is utterly lacking in the wit, charm, and grace of that classic by Rob Reiner and William Goldman. Where 'The Princess Bride' is playfully minimalist, 'Stardust' is indulgently overwrought. Where 'The Princess Bride' inventively deconstructs famous fairy tales, 'Stardust' is derivative and dull. The two movies obviously set out to achieve the same goal, but the results couldn't be further apart. Relative newcomer Charlie Cox stars as Tristan Thorn, a young lad from the rustic English village of Wall, so named for the (strangely, not all that tall) stone barrier that the locals have been told separates them from another world and have been forbidden from ever crossing. With some help from his father, the only person who has ever snuck through the sole gap in the wall and returned, Tristan sets out on a quest to claim a falling star for the shallow and annoying girl (Sienna Miller) he wishes to woo. Once on the other side, the boy finds himself in the fantasy kingdom of Stormhold, a magical land where that falling star has manifested as a beautiful damsel named Yvaine (Claire Danes). Determined to bring her back as a prize for his love, Tristan essentially kidnaps the girl and begins the trek home, only to have his mission jeopardized by the conniving princes of the land and a trio of evil witches, all of whom want the star (or the locket she possesses) for themselves. The premise sounds clever enough, and the movie has a pretty good cast including Michelle Pfeiffer as the head witch, Robert De Niro as a pirate lord who helps Tristan on his journey, and Ricky Gervais in a bit part as a merchant of magical goods. Pfeiffer is every bit as gorgeous as ever (when she's not hidden under old hag makeup), and seems to be having fun vamping it up as the villainess. Claire Danes is also quite charming as the distressed celestial entity, one of the few critical elements in the movie that works exactly as intended. Some humor involving Pfeiffer's goat-like henchman Billy and an ever-increasing number of dead princes who hang around as ghosts to comment on the action is indeed fairly amusing, if not quite gut-busting. Unfortunately, the picture's tone almost never hits the right notes. Directed by Matthew Vaughn, whose last effort was the entertaining crime caper 'Layer Cake', the film is lead-footed when it needs to be breezy and nimble, and irritatingly forced when it tries to be whimsical. It lacks the sly humor and witty verbal banter that made 'The Princess Bride' so winning, and is overly reliant on the spectacle of mediocre CGI. The whole thing is slathered in a dreadful musical score. Worse, Robert De Niro, apparently believing himself to be starring in a revival of 'The Bird Cage', continues his career decline by delivering an embarrassing and offensive performance of swishy gay stereotypes. He might have gotten away with something like that in a 'Saturday Night Live' skit, but not a feature film. The movie does pick up towards the end, and actually has a reasonably exciting climax, but it's just not enough to make up for how dull the rest of it is. The film's marketing campaign failed to make any of it look appealing (what did they have to work with? ), and 'Stardust' tanked at the box office. In this case, I don't feel all that bad for it. 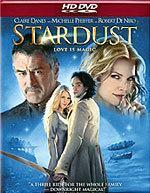 'Stardust' comes to HD DVD from Paramount Home Entertainment, who've packaged it in some really ugly cover art. On the plus side, the studio doesn't seem to be forcing their High Definition promo trailer at the start of their discs anymore. 'Stardust' is presented in its original 2.35:1 aspect ratio, in a 1080p/AVC MPEG-4 transfer that's nothing special in any respect. The movie seems to have been photographed in a diffuse, soft-focus style to enhance the fairy tale atmosphere or something. On top of that, the entire movie has a very "processed" appearance, with wonky colors that rarely look natural. The result is a muddy image with an unimpressive level of detail. Most facial features are waxy, even in close ups. The actors have pallid flesh tones and bright pink lips. Meanwhile, colors elsewhere are artificially oversaturated in a way that screams of digital manipulation. The contrast range is also rather flat. I'm not going to pretend to know how much of this is the fault of the original photography, how much was caused by creative tinkering at the Digital Intermediate stage of post-production, or how much is the result of excessive filtering during the disc transfer. It doesn't look terrible by any means (I've certainly seen worse), but the whole thing is just rather blah. Considering the movie we're talking about, I suppose that's fitting. The Dolby Digital Plus 5.1 soundtrack didn't do much for me either. The film's sound mix is poorly balanced between quiet dialogue moments and excessive bombast. Either the movie is really quiet, or it's gratingly loud, with almost nothing in between. The lousy musical score has a fair amount of swell, but fidelity is a bit dull. Bass gets a moderate workout during the action scenes. Surround activity is limited to gimmicky, attention-grabbing directional effects. There is no attempt whatsoever to fill the back soundstage with subtle ambient cues. As with the video quality, the soundtrack isn't awful, but it is awfully bland. To say that the HD DVD retains all of the bonus features from the standard DVD edition isn't much of a compliment when the pickings are this slim. Good Omens: The Making of Stardust (30 min., HD) – Credit where it's due, this is one of the few "Making of" specials I've watched in ages that actually had anything to do with the making of the movie in question. Where most are really EPK promotional nonsense comprised of interviews with the cast gushing about what a wonderful experience they had and how great everyone was to work with, instead here we get a real glimpse of the movie's production, from the sets being built to the actors shooting in front of green screens and the visual effects being added later. Even so, it's not all that exciting, and contains no real insights or revelations into the filmmaking process. Deleted Scenes (6 min., SD) – Six brief scenes are offered in terrible workprint quality, with time codes and Paramount watermarks plastered all over the screen. Two of the scenes involve the ghost characters and are kind of amusing if insubstantial. An alternate ending doesn't work any better than the one that made the cut. Blooper Reel (5 min., SD) – The usual assortment of flubbed lines and actors stumbling around the sets. Boring. Theatrical Trailer (2 min., HD) – This misleading ad makes the picture look like an exciting action movie. What happened to that movie? That's the one I'd rather see. Sometimes, great movies get inexplicably overlooked by the critics and the public, only to make wonderful discoveries on home video. 'Stardust' is not that type of movie. Sometimes a bomb is just a bomb. Further, the HD DVD offers nothing special in terms of picture and sound quality or bonus features. There's just no reason to buy this. Stick with a rental if you're really curious.